The epic tale of the galaxy far, far away being saved from the brink of total disaster under the wicked control of the corrupt Empire is a tale that is well known and continues to be told and grown with every passing moment. Many of us grew up with the Millennium Falcon, just knowing that for as awesome and powerful as the Force might be, nothing could have been done without the actions of the Rebellion. And, without a couple lone agents willing to put their skin in the path of the fire, even that would have failed. We watched as Hans Solo proved to be the exact kind of hero that we rarely got to see… one that was rugged, capable, willing to do what needed to be done to help people who needed it while also making sure to take those few moments for himself. Between the war of ‘who shot first,’ we all realized that our rogue hero was, indeed, just the right amount of smuggler to be able to tackle the heroics full time. And, then, we all look forward to being able to share that same experience with the next generation. And now you have the chance to truly do that by giving your tyke the chance to be the greatest captain we’ve ever known with this Deluxe Han Solo Child costume. Ths cream colored long sleeved shirt will be immediately recognizable, even with its deep V slit down the chest. 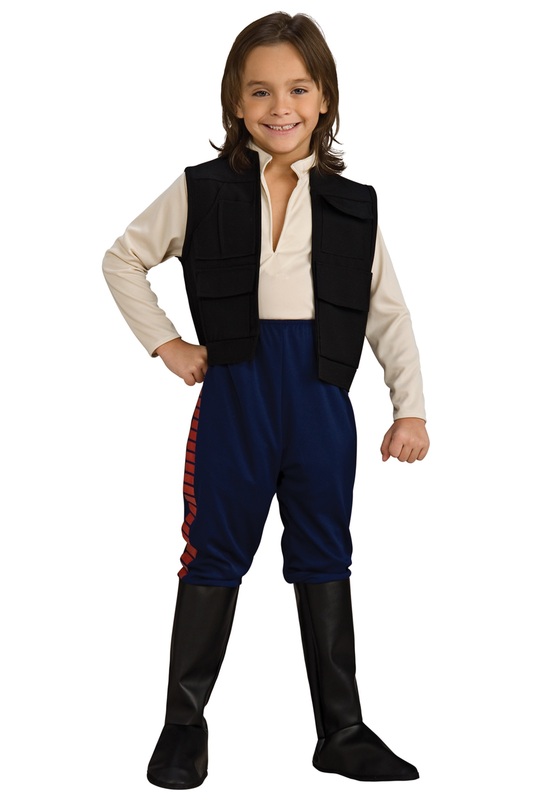 The black vest has usable pockets and the navy blue pants with attached boot tops keep your kiddo ready to confront any threat, whether it is a shifty green alien in the bar or even facing all the agents of the Sith!